The noble white grape Riesling originates from the Rhine region in Germany. While many of you think German Riesling is always sweet, that is a mis-conception as more and more German Rieslings are being produced dry (trocken). With an upward trend in world-wide plantings, only behind Chardonnay and Sauvignon Blanc, other regions like Australia, Canada, New Zealand and Washington are also producing world class Rieslings. The grape has wonderful acidity (one of the reasons why it is great for producing sweet dessert wines), it also boasts great longevity and also has fabulous food pairing potential. All these wonderful traits will be on display and discussed at our upcoming De-Mystifying German Riesling stand-up tasting, scheduled for Saturday, September 17 @ 7pm – $40. 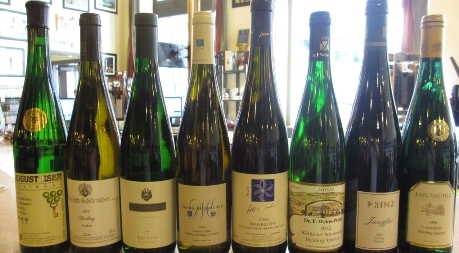 deVines has one of the best German selections in the country, and this is your chance to taste through eight wines that show terroir influences of various regions, as well as varying levels of ripeness and sweetness. You may never go back to a Chard again after this tasting! Michel Rosier left his native Champagne and settled in the beautiful region of Limoux to set up Domaine Rosier. The property goes back three generations and is still very much following the same traditions today. The 35 hectares of vineyards A.O.C. situated in the village of Villelongue-d’Aude, almost in the southern most tip of the Languedoc, comprises essentially the varietals of Chardonnay, Mauzac, Chenin and Pinot. The vineyards, which constitute the major source of the production, are cultivated without chemical fertilizers and grown in a very ecological fashion in order to realize musts of the finest quality. 2013 Domaine Rosier Cuvee Ma Maison Cremant de Limoux (Languedoc-Roussillon, France) – $21.99. The Cuvée Ma Maison is 60% Chardonay, 30% Chenin Blanc and 10% Pinot Noir. The grapes are grown 300 meters above sea level and is hand-picked from vines that are on average 20 years old. Accolades include a Médaille d’Or Concours Général Agricole PARIS 2014. A complex bouquet infused with subtle hints of white flowers and fruits as well as multiple sensations for the palate; elegance, balance, lasting freshness with hints of lightly mentholated citrus fruit. Ideal with aperitif, fish or seafood. Also available in magnum format – 2013 Domaine Rosier Cuvee du Rosier 1.5L (Languedoc-Roussillon, France) – $44.99. 2013 Domaine Rosier Cuvee du Rosier (Languedoc-Roussillon, France) – $19.99. The Cuvée Domaine Rosier comes from the appellation of Blanquette de Limoux produced by 90% Mausac and 10% Chardonnay grapes grown on océanic argilo calcareous slopes. Pale yellow in colour, luminous and crystal clear with numerous fine bubbles, rising swiftly, it is beautifully effervescent. The nose is clean and engaging; it brings to mind the aroma of white fruits such as apples and pears, but in addition has nuances of fruits with yellow flesh mixed with the fragrance of spring flowers. The palate offers up a hint of honey-flavoured bonbon. The overall impression is one of light and fresh and well perfumed and fine length. Try wth appetizers. 2013 Domaine Rosier Cuvee Ma Maison Rose Cremant de Limoux (Languedoc-Roussillon, France) – $22.99. The Cuvée Ma Maison Rosé’s grapes are grown on the sunny slopes around the fortified village of Villelongue and hand-picked from vines that are on average 20 years old. A beautiful salmon-pink hue, with a few subtle orange tinges, crystal clear with an abundant sparkling effervescence and numerous fine bubbles, which rise rapidly to the surface. The nose is fresh and bright evoking summer fruits such as strawberry, raspberry and red currant. Aeration adds a touch of grapefruit to enrich the experience. Try with avocado and spicy prawns. Do you have a sweet tooth like me? and always looking for a swell way to end a meal? Well, in this blog, i am tempting you with a wide assortment of thrilling high end ultra-premium dessert wines that will suit that very special occasion and definitely put a smile on your face. 1) 2005 Domaine Huet Clos du Bourg Moelleux Première Trie (Vouvray, France) – $79.99. This is a full bottle from Huet – one of the biggest names in the Loire Valley, and is made from Chenin Blanc. This oily textured, exotically fruited dessert wine can be drank by the glass because it is so light on its feet and not at all cloying. Certified biodynamic. Can age effortlessly and improve with bottle age. Calls for a fresh fruit flan. 2) 2001 Moulin Touchais Coteaux du Layon (Loire Valley, France) – $56.99. Another legend from the Loire – this is an altogether different expression of Chenin – waxy, honey, almond, saffron, wet wool and clementines and citrus peel in an even lighter package than the Huet. Unusual minerality that borders on a touch of earthiness. Another drink by the glass dessert wine, with all kinds of aromatic complexity. Try with a rhubarb ginger pop tart. This is capable of 30-40 years of aging as a recent 1971 showed superbly! 3) 2010 Hexamer Rieslng Eiswein (Nahe, Germany) – $169.99. If you thought Canadian Icewine was expensive, well German ones are even more so. Extremely rare, you don’t see a lot of Eiswein in the Alberta market because of tiny production and the producers tend to keep it for themselves! Hexamer is one of our favourite German producers, this Riesling is from the Nahe region known for their minerality – this is spicy, with stone fruits and custard in abundance. Great acidity never makes it taste syrupy or cloying. Calling out for a peach cobbler and home made vanilla ice cream. 4) 2000 Tokaj Classic Aszú Essencia (Tokaj, Hungary) – $149.99. 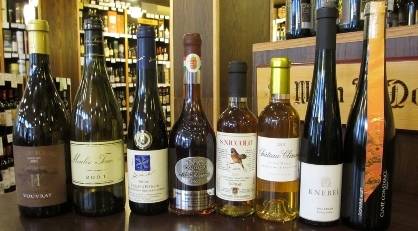 Tokaj is the Hungarian classic dessert wine made from six possible indigenous grapes affected by noble rot – it is in the tawny style so more color, molasses and toffee notes. There can be an orange element to these wines. You are probably familiar with the Puttonyos system, ranging from 2 to 6 meaning increasing sweetness. Essencia is essentially a level of ripeness and sweetness beyond 6. You get the idea. A nector of the gods. Try with a homemade chocolate orange pound cake. 5) 2009 Castellare di Castellina Vin Santo S. Niccolo (Tuscany, Italy) – $45.99. The so called ‘holy wine’ is from the Tuscan region usually made from Trebbiano and Malvasia grapes, harvested and dried on straw mats. Apricots, honey, caramel, brown sugar with fine sweetness, great length and refined acidity here. Superlative wine that is a fabulous match with a panna cotta adorned with pistachio nuts and a drizzle of fine balsamic vinegar alla Corso 32. Decadent and a price quality ratio champ. 6) 2007 Château Climens Premier Cru (Bordeaux – Barsac, France) – $131.99. Sauterne is the class of the dessert field, and Climens (a Barsac) is light as a feather compared to most. Searing acidity, lots of botrytis (noble rot), you will wonder how something so light can have such great complexity and incredible length. Next to the d’YQuem, one of the world’s best dessert wines consistently. You could do a fresh nectarine or peach tart, or just as well, nothing at all. 7) 2010 Knebel Winninger Uhlen Riesling Beerenauslese (Mosel-Saar-Ruwer, Germany) – $159.99. Beerenauslese is the German term for ‘late harvest’, and this Knebel is a stunner with its spice, sunny lemon, orange, forest honey, saffron and citrus rind notes. Spectacular body and mouthfeel, not as much botrytis as the French, long glycerin oily finish. Not as sweet as some on this list, try with the Duchess’ Lemon Chiffon cake. 8) 2009 Domaine Huet Cuvee Constance (Loire Valley, France) – $167.99. This ultra-rare organic Vouvray from Chenin Blanc is only made in the greatest of vintages (for example, there hasn’t been one made since the 2009, although the 2015 is rumored). Peach, lime, ginger, spiced apple, ginseng, saline, hazelnuts, green tea, flowers, blossoms, marzipan in a minerally package. You name it, this has it – this is truly one of the greats of the world spoken in the realm of d’Yquem. Every dessert lover should taste this once in a lifetime. Try by itself or with some blue-veined cheeses and assorted roasted nuts. 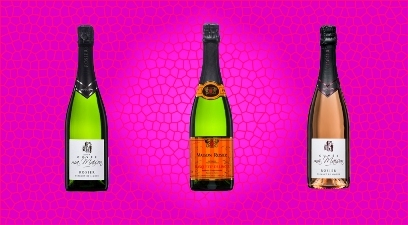 There you go, some out of this world wines for the sweet wine lovers out there! Salute! Our August Case of the Month – $220.22 is a great sampler case for those wanting diversity, discovery and affordability in everyday drinking wines. We choose wines for this case to showcase their true varietal characteristics from wine regions all over the world. It is seasonal in nature as well, more whites and pinks and lighter reds during the summer and more full-bodied reds over the winter. It is a great way to discover your palate besides always having some wine on hand. August features wines from all over the world including France, Germany, Portugal, Chile, Spain, Argentina, Italy and Australia with a wide assortment of grapes for every drinking occasion. You can purchase the August Case of the Month here..